I know, I am like a dog on a bone with this stuff. 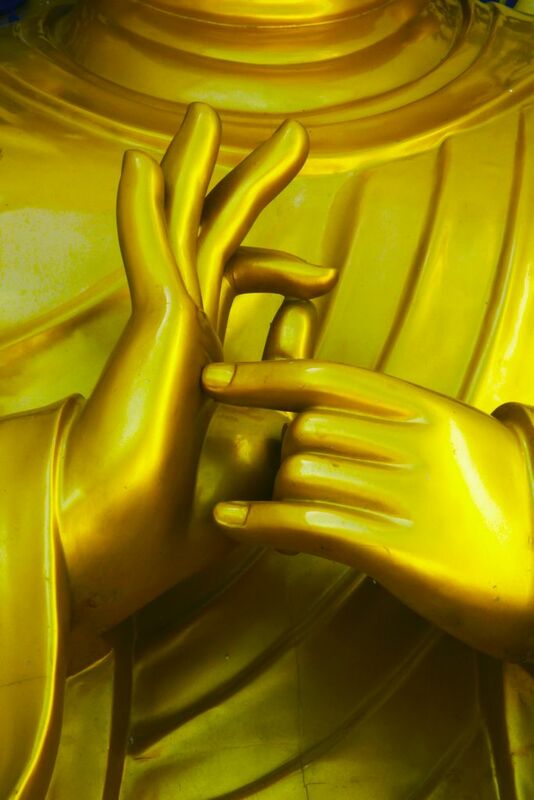 The point of this series of blogs is to help make the "intangible" tangible, to become familiar with some of the more subtle Buddhist concepts. While intellectual distinctions of this kind may appear on the surface to be overly conceptual, these particular concepts translate rather quickly to the sphere of action, where mistakes on our part have real consequences. As an example, it can be important to understand the difference between accumulating good karma and accumulating merit. They are quite different. Karma of any kind always has to do with Samsara (this world of cyclic existence) and never with enlightenment, while merit pertains to our eventual liberation from Samsara -- enlightenment. It is said that the accumulation of karma is certain, like a shadow following an object, and always leads to a higher or lower rebirth within cyclic existence. Our karma, even the best karma, will never liberate us, but only determines the kind of our next rebirth. Karma is inextricably bound to this world of cyclic existence. And karma pertains only to our intentional action. Actions of ours that are involuntary, unintentional, or just unconscious are not karmic, since the volitional accent is absent. With karma, it is always the intent that is important. On the other hand, merit is one of the two causes of our liberation from Samsara (and eventual enlightenment), the other being wisdom (awareness). And there are said to be three basic causes for the accumulation of merit: generosity (giving), moral discipline (virtue), and meditation. Dharma practice is all about the accumulation of merit. And this practice is most often repetitive. Repetition of meritorious actions is important, if only to get them right. This is one of the reasons that various Buddhist practices are sometimes repeated 100,000 or more times, to make them habitual and pure. The chief contamination of our actions is considered to be reification, the mistaking of an ever-changing process for a real and permanent thing. You know, like the old song "Row, Row, Row You Boat," and the line "Life is but a dream." Well, mostly we believe that dream is real. We reify it. Reification is defined as the fallacy of misplaced concreteness, like taking for reality what is just something we imagine or wish to be so, like the imagined permanence of the Self. We do it all the time. Reification is a conventional truth that we assume for convenience. For example, the idea that something such as an automobile is a permanent thing. We can replace every single part in a car, which proves to us that what we have is a process and not anything more permanent. But it is conventionally convenient to consider our car as permanent, even though we know it is not. We do the same thing with our self image, and so on, like acting as if we will live forever. We believe that what is impermanent actually exists in a permanent way. In other words, we "reify" (assign permanence) for convenience, forget we have done so, and then remain attached to our own creations. In dharma terms, these are examples of the obscurations that cloud our mind. The two accumulations (merit and awareness) are the cure for reification. Merit requires a certain purity to be effective. My point here is that it is not always simple to perform a meritorious action without contaminating it with our own tendency toward habitual reification, without misplaced references to our self, and so on. In Chinese martial arts it is said that an action must be practiced 100,000 times for it to become automatic, and no longer require conceptuality. Dharma practice is similar. We repeat an action, like saying a mantra countless times, in order to purify that action and remove the contamination of reification. It is clear that we need to discuss merit and awareness in more detail. For now, I will leave you with a description of the three kinds of bodhisattvas. The KING, who works for the common good by aspiring first to perfect himself and achieve enlightenment, and then to help others. The FERRYMAN, who ferries sentient beings across Samsara to enlightenment, including himself. The SHEPARD, who puts others' enlightenment ahead of himself, refusing to go into enlightenment without everyone else. As mentioned, only the first type of bodhisattva is said to actually exist because unless we are enlightened ourselves we can't lead others anywhere. For me, the way I understand these three is as a progression. First we enlighten ourselves (The King), then we accompany everyone else to enlightenment (The Ferryman), and finally we put everyone's enlightenment ahead of our own (The Shepherd). Your thoughts on all of this please.